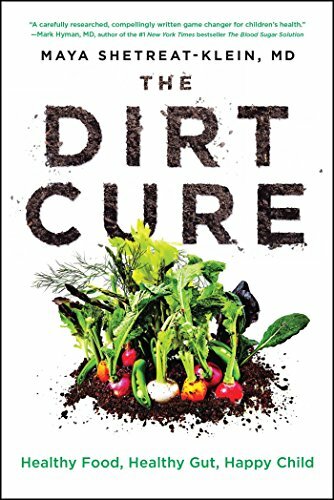 A year ago Dr. Maya Shetreat-Klein's "game-changer for children's health" book: The Dirt Cure: Healthy Food, Healthy Gut, Happy Child was published. She started out as a traditionally trained paediatric neurologist. In private practise in New York she saw many children on more medications than their grandparents for things like allergies and ADHD. These pharmaceuticals appeared to curb the symptoms of the maladies, not the root causes. She did not feel right about it and at one year old her own son developed a frightening mystery illness. He began experiencing wheezing, rashes and signs of delayed cognitive development. After visiting multiple doctors an allergist uncovered her son's severe allergy to soy. Dr. Maya spent a lot of time delving into the scientific literature and found that food and nutrition played a big part in how to heal children's bodies and brains. She wanted to know what science was saying and found that being exposed to diverse microbes is what makes our guts, immune systems and our brains healthy. She found this to be particularly true for children because they are developing immune systems and they very much need exposure to these microbes. Dr. Maya’s philosophy is that the health of our inner terrain—our bodies– is a reflection of the health of our outer terrain, the natural world around us. Gut, immune and nervous system—and the many microbes therein—are a direct reflection of the food we eat and where that food comes from. Her book is all about getting access to diverse microbes, eating fresh unprocessed foods from healthy soil and spending time in close contact with nature. Her book helps parents to transform their children's health by understanding the profound connection of their bodies and minds to nature and food from nutrient and microbe-rich soil. She recommends organic and pesticide-free foods. "A healthy terrain is dirty, messy, complex, and doesn't come in a pill or a package. It's the very messiness of the natural world that makes us so resilient, which is the key to robust health." She told The New York Times: "Children's immune systems are very social: They like to meet and greet a lot of things." "It seems the more they meet and greet, the more likely they are to be in balance, and the less likely they are to let any one microorganism grow out of control, as occurs with infection." In the book there are very candid discussions about pesticides that now coat the majority of vegetables found in supermarkets. According to this article The Dirt Cure dissects the food and pharmaceutical industrial complexes that have turned what we eat into sometimes unrecognisable versions of themselves, and the mounting evidence of how these poisons are provoking huge rises in chronic childhood illnesses, as well as cancer and illness in adults. Inhumanely treated and anti-biotic/hormone laden meats are also discussed and should be avoided because they harm the human microbiome. Dr. Maya says science now show that using bleach actually make kids more likely to get sick, not less; these children have a 20 percent higher risk of coming down with the flu (source). "Don't be afraid of microbes because they train the immune system to be healthier." Video: by the Energy Blueprint. Dr. Maya Shetreat-Klein was interviewed on why dirt is an integral part of good health. Maya Shetreat-Klein, MD is a pediatric neurologist, herbalist, urban farmer, naturalist and author of The Dirt Cure: Growing Healthy Kids with Food Straight from Soil, which has been translated into ten languages. See full transcript here. Dr. Maya say that kids who eat a lot of processed foods are more likely to become allergic or chronically ill. "On the other hand, children who are well-nourished with nutrient-dense foods grown in rich soil, have the tools they need to be resilient in the face of infection and other stressors. These children are even more likely to be healthy if they're given opportunities to be outdoors and exposed to varied amounts of diverse microbes, which strengthen and balance their immune systems." infection, it's stronger and more resilient the next time one comes round." The book explains that some of the primary reasons our children have more incidences of chronic and recurrent illness, asthma, allergies, ADHD, autism spectrum disorder, autoimmune issues, continuous colds and coughs, and so on is that their internal microbiomes have become depleted and stressed due to a great number of things, including environmental toxins, processed food, plastics, antibiotic use, and overly "clean" living spaces. In chapter 11 of her book she speaks about being notorious for imposing travel adventures upon her family that involve finding foods typically not available to city dwellers. Raw, unpasteurised milk ranks high on that list. She was startled to discover on her travels that many dairy farmers don't drink pasteurised milk from the supermarket. Almost in uniform, the farmers she's met prefer their milk fresh and raw. In upstate New York certified raw milk is available direct from the farm and also farm to door via farm share in NYC. This means that New York state requires frequent microbiology checks for various bacteria to ensure quality. "I value the fat in pastured milk, both for the taste and the many health benefits. The creamy texture and rich flavour of this milk were heavenly and sated everyone's appetite for hours more than usual." Dr. Maya refers to the 1908 Nobel Prize winner Ilya Metchnikoff who described the longevity of the people living in Bulgaria and other isolated European countries who consumed fermented dairy products. healthy. Everything that we eat must be rich with nutrients and minerals—all the way down the the water sources that feed the soil that grow the grass that feed the cows that give milk that we drink. Healthy outer terrain begets healthy inner terrain." In the same chapter she also discusses milk produced by dairy cows who live in a manner far less idyllic. The industrialisation era circa 1800 saw the rise of overcrowding, confinement, the pathogenic bacteria that grew in abhorrent conditions and the nineteenth century solution that made all the milk sterile called pasteurisation. "While it's true that in rare cases, milk even from healthy cows can contain bacteria that may render some vulnerable people ill, producers can test for the presence of such microbes on a batch-by-batch basis to prevent consumer exposure to potentially problematic strains. And certified raw milk will always be tested regularly." "Paradoxically, the presence of diverse bacteria and active enzymes from raw milk—rather than their absence—protects milk from overgrowth of nasty bacterial strains." Dr. Maya Shetreat-Klein is an integrative pediatric neurologist board-certified in adult and child neurology as well as pediatrics. A lifelong foodie and environmental activist, she has dedicated herself to understanding the connection between nutrition, toxins and neurological health. Dr. Shetreat-Klein has gained recognition by successfully treating hundreds of children with neurological issues using an integrative approach, which includes functional medicine, herbs, mind-body techniques, and homeopathy. She believes in using a gentle, nurturing approach to treat children and young adults with neurological, gut and immune issues. She is now also an urban farmer with her own goats. Visit her website www.dirtcure.com. The Dirt Cure has been translated into ten languages and should be required reading for everyone over the age of 13 and living in Australia. In this country there have recently been a lot of evidence that the government and other organisations with vested interests seem to support only large and industrial agriculture who do not necessarily farm in a sustainable way. At the same time small-scale, ethical and sustainable farmers are disadvantaged with unfair and over-reaching regulations and red tape. Like in America, many large-scale commercial crops are now grown in mineral-depleted, unhealthy soils with the excessive use of pesticides and chemicals that harm all microbial life. Let's say no more to consumption and depletion and yes to regenerative agriculture. Posted on October 5, 2017 by ARMM Admin and filed under Health and Research, Vegan Resources and tagged Maya Shetreat-Klein The dirt cure: healthy food soil ecology microbiome raw milk articles.